Check out this German jousting armour. This is Protection with a capital P! The plates are good and heavy. The helmet has slits for eye openings, to keep the knight's eyes from being gouged by the opponent's lance, as he is aiming to dislodge the crest from the helmet. If the opponent is wearing similar armour, his vision wasn't all that good, so aiming that lance is a tricky business. Fast forward to the present: When buying cars, we check out the safety ratings, because in the case of an accident we need the frames of our cars to give protection to ourselves and to our children. But times have changed. CelloMom can't remember the last time she saw a jousting knight thundering out of the woods and onto the two-lane roads in her town. Can you? -- So why are the windows by the back seat getting smaller by the year? As an example, consider the Honda CR-V, one of those CUVs much favoured by women. One assumes that a decent fraction of those women are moms who use their CR-V for ferrying their children. In a 1998 CR-V children had a glorious view out of their window. As long as you were in a child seat, you could still see down to road level. Those children would not be happy if their mom bought a 2011 CR-V to replace her old trusty one from 1998. Just as the kids have grown from tots to teens, the window area in the back row has shrunk - by quite a lot. The bottom of the window frame has been raised, and the top of the frame is lower. Not only that, the third window has shrunk to the size of an afterthought. Now that the children have grown to who knows what heights, they would have no trouble looking down to the road surface, but they couldn't see the sky without some creative contortions on their necks, or else they have to do what you keep telling them not to do, which is to slouch way down on their seats. Why would a car designer do this? Surely not to please the children in the back seat, but rather their parents, who after all are the ones who have to sign the financing papers. It has been suggested that when the bottom of the window frame follows a rising line towards the rear of the car, it makes the car look more sporty. Hmm. CelloMom could do without that one. CelloMom is all for her self being sportier than her car. So the top of the window frame follows a downward sloping line, from the front to the rear of the car. If the roof were made to slope that way also, there is a very good aerodynamic reason for it, since the downward curve actually contributes to the fuel efficiency. Some models just end up looking like a large gorilla has been sitting on the rear end of the roof. 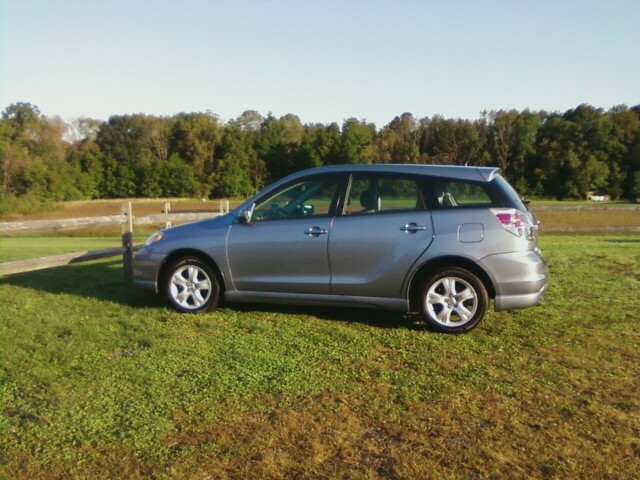 On cars like the Toyota Prius or the Honda Insight, not only does the curved-down roof look pretty, the outline of the car resembles a leaf which pleases the green-leaning buyers. But what to think of a car of which the windows follow the downward curve, while the roof stays reasonably flat? 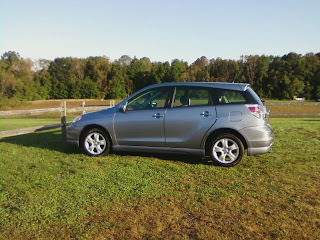 The Toyota Matrix is one of many examples. The overall assembly looks pretty enough. But then you get a nagging feeling that it's only appearing to be aerodynamically correct without actually being so. Reminds you of those politically correct university science departments whose websites trumpet their women-friendliness but whose sole female faculty member can be found in a lab in the basement. At last, in 2012 the Matrix has a roof that actually curves down, so that the line of the roof follows the line of the windows. But the children on that back seat had better not grow to basketball players. Besides, they've taken away the third window altogether, so sitting in the back now feels like occupying a cave. Because the bottom line of the window frame is still tilted up. But - the whole point of a car ride is to look at the world outside. Even on the daily ride to school, somehow there is something interesting to see every day. Children in the back of a 2012 Matrix can still try to peer through the front side windows, which have remained relatively high. The same cannot be said of the side windows of the new Range Rover Evoque, which are small front and back. It is not entirely clear what this car is supposed to evoke; to CelloMom it only brings to mind the image of two gorillas dallying on the Rover's roof all night, leaving at daylight completely satisfied - in the knowledge that they have ruined a perfectly good car. The Evoque resembles nothing so much as that medieval helmet with the slits. What are its owners so afraid of?